We here at Traxx Mobility Systems are in the business of helping those with limited mobility. We often take calls from people who have questions and concerns about creating a safe environment for themselves or their loved ones. 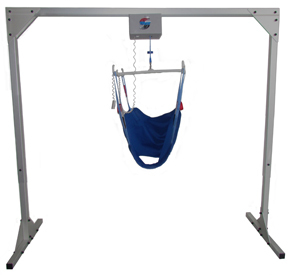 Most of the calls relate to the bedroom and our product, the Titan 500 Patient Lift. We are always happy to share our experience and resources with people who are looking for workarounds in other parts of their home relating to mobility. 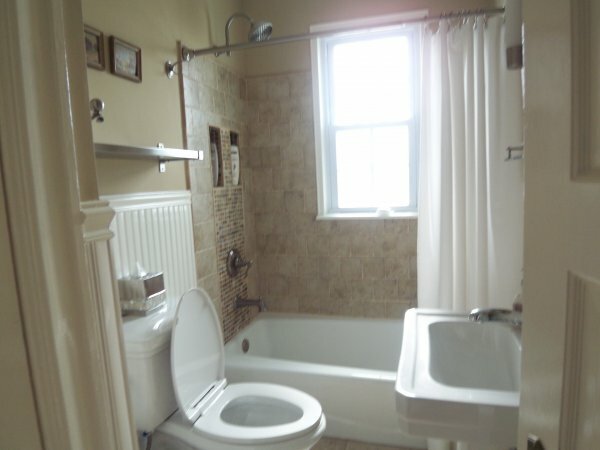 People often have problems accessing their existing bathrooms. Our freestanding overhead patient lift system works wonderfully in the bedroom or living room, but might pose a difficult fit for the typical bathroom. Many of the family caregivers we speak to are inventive in their approach to use existing tools to address a barrier free environment for themselves and their loved ones. This is where the Great American Mind comes in to play. I have spoken to many a self-taught American inventor and designer. Home-made contraptions and adaptations as well as the good old-fashioned workaround is often the result. While these may be achievable and cost effective, they often result in an increase in the effort needed by the caregiver or a downright unsafe solution. A case in point is a phone call I took recently from an older gentleman who was taking care of his disabled wife in their home. A small lip at the edge of the shower stall presented an access problem. He was unable to get her and her shower chair over the threshold safely. He employed a typical Hoyer lift to get her out of bed and in to her wheelchair. He was still able to use the lift with ease so he wasn’t ready to replace that particular piece of equipment. 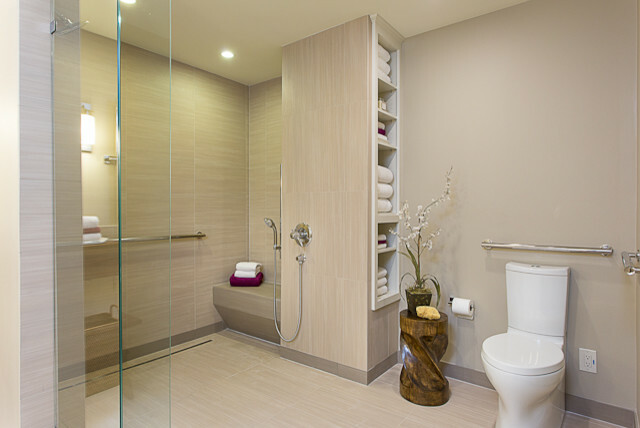 He thought the best solution was to get some sort of lift, perhaps our Titan 500, to lift her out of her wheelchair, outside the shower stall, and transfer her to her shower chair, which he would put inside the shower stall. The Great American Mind was at work. He was trying to find a solution given the equipment on hand and the access problem in front of him. Those with a working knowledge of barrier free design can easily see the solution to his problem, but for most people, they rise to the challenge and come up with a workaround using what they already have. After a brief discussion about his dilemma, it came to light that his son was in the construction business. I pointed out that it might be easier for him to remove the obstruction in the shower stall than to go through the workaround he had devised. It hadn’t initially occurred to him but once it was offered as a solution, it became apparent how easy it was to solve his problem. Over the years, many homeowners do some sort of repair or upgrade to their home. It is now time for them to consider their future needs now before they do the work. Look at the repairs and upgrades through a different perspective, through the eyes of an older you. Remove barriers and obstacles during the design process. Barrier free does not need to mean ugly or industrial and it should not present unrealistic costs. Simple modifications can often have the biggest payoffs. Simple and small incremental changes can save you money and time while still addressing your future needs. Another example of forward thinking can be to use the rooms in your home in new ways to address needs and by-pass barriers. Having trouble getting up the stairs? You could install a stair lift or you could simply have your bedroom moved downstairs. Two different options with two different costs involved. Income and product costs often define what sort of solution will work best for the individual homeowner. Home design and home age can also define the types of changes available. Barrier Free Living and Aging in Place are more than fancy new buzzwords. They are important strategies to learn about as you age and prepare for your long term care options. Many design and construction companies specialize in this area and are available for consultation. Traxx Mobility Systems is always happy to discuss all of the options available to you and your loved one, including our unique Freestanding Overhead Patient Lift System, the Titan 500. Please visit our website, find us on Facebook and watch our channel on YouTube for more information regarding our patient lift. Feel free to call us on our toll-free number to discuss mobility issues and options for your own home. That number is 855-872-9967.